This story is based around open shutters................! ...... or George and Amal will be coming soon so his housekeeper is getting everything ready. The press put out this story every year right? Yes, that story about the shutters is run every year. Nice pix and Amal is driving . Hey guys it doesn't look like Amal is driving. At least to me. I definitely see a man behind the wheel. His hand is on the steering wheel. Looks like Amal was in the seat behind him. But nice to see them in Como. The DailyFail needs to get on their game. The man with black hair in one of the pics of the 'ilgiorno' article looks familiar to me. Could he be one of George's friends? Maybe related to Grant? They were at the Black Cat restaurant for dinner. 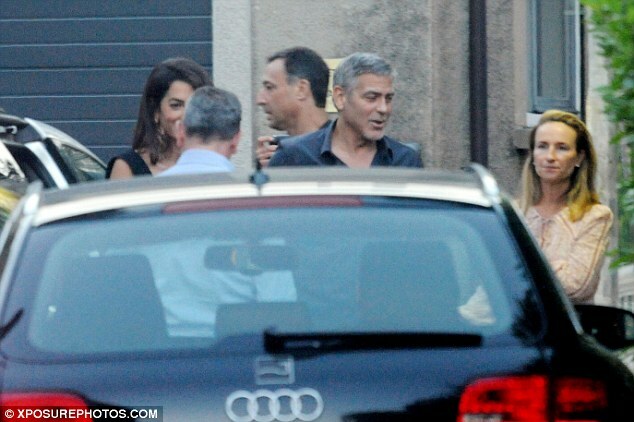 Your right Donnamarie, George was helping Amal out of the car maybe that was Gio driving. carolhathaway wrote: The man with black hair in one of the pics of the 'ilgiorno' article looks familiar to me. Could he be one of George's friends? Maybe related to Grant? I thought he is Grant's brother. Mickey? He does look really familiar. Who can confirm this? I'm sure he was in the wedding pics in Venice. Carol the man your talking about looks like one of the men in the group picture from the wedding with the boys. PAN - Did you notice? On their "Guests" page they have a picture of George - with Elisabetta! They'd better hope Amal doesn't see that! I noticed that Lizzy! Think there are two pics. And I think that was the last pics of the two of them together right before they split! PAN - I think some people might have a standing invite - Grant, Bill Murray, the boys - and some might be invited if he's working on something with them. He probably invites people all the time, as he sees them, and it occurs to him that they might want to visit. I'm guessing the scheduling is pretty fluid and informal since most of the people he knows have complicated schedules. There is also probably an open invitation to family to join them as well. LizzyNY wrote: PAN - Did you notice? On their "Guests" page they have a picture of George - with Elisabetta! They'd better hope Amal doesn't see that! Now that would be interesting dinner conversation!! From the DailyFail. And they failed ... again. At least I think. Their report claims these pictures are from today (Friday). I think the DM must have gotten the date wrong. She'd never wear the same thing two days in a row - especially if they were going to the same place they'd been the night before - and the photos were posted in the media yesterday, sooo... if the DM's pictures are from today that means they went back to the restaurant again and she was wearing the same thing again. 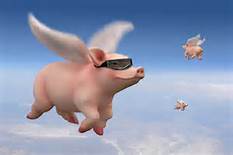 That's as likely as pigs flying! They have been enjoying a well-deserved retreat to Italy as of late. And on Friday, George Clooney and his stunning wife of nearly two years Amal continued to keep the magic alive, making their way to a romantic, candlelit dinner date at il Gatto Nero restaurant. 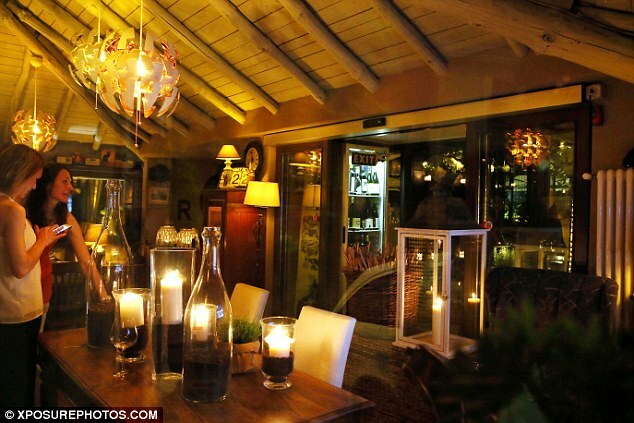 Nestled just along the coast of Italy's world-famous Lake Como in Cernobbio, where George, 55, also owns a villa, the intimate eatery boasts unparalleled views of the neighboring waterfront. Doubtless, the evening was a refreshing change of pace for the ordinarily busy couple, who looked in top spirits as they headed outside of the restaurant following their scrumptious dinner. Looking stunning as usual, Amal, 38, curled her glossy brunette tresses into luxurious, lush ringlets, which were swept into a slight and stylish side part. he human rights attorney put her style credentials on show as she sported a chic and summery off-the-shoulder black crop top to display her toned tum. The flirty top was teamed with a matching black skirt which fell knee-length, and was topped off with a pair of pointed heels. She added some glam with her eye-catching gold chandelier earrings, while carrying a clutch with a pretty floral design. Highlighting her striking features, Amal opted for a coat of pink blush and a matching shade of lipstick. 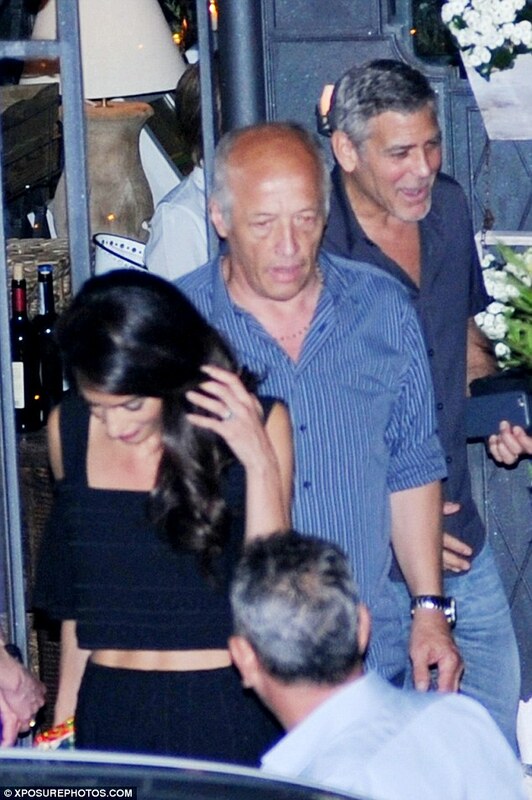 Amal's husband, meanwhile, kept it casual and comfortable with his grey button-up shirt and jeans. As the couple made their inside the waterfront restaurant earlier that evening, the twosome were inseparable as they strolled on inside. Amal and George tied the knot in Italy in September 2014. These last few weeks have seen the couple travel through Rome, where they attended a seminar led by the Pope called 'Un Muro o Un Ponte' at the Paul VI Hall in Vatican City in late May. The event aimed to promote work by global educational initiative organisation Scholas Occurentes which works with young people all over the world, and highlighted the plight of migrants attempting to reach Europe. Pope Francis awarded medals to Richard Gere, George and Salma Hayek for their contributions. 'Important values can be transmitted by celebrities,' said one of the organisers, Lorena Bianchetti, adding that the actors had agreed to be ambassadors for one of the foundation's arts projects. Leave it to the fail to get the dates wrong. Thanks for posting benex. Unfortunately we've got two threads on the same dinner. 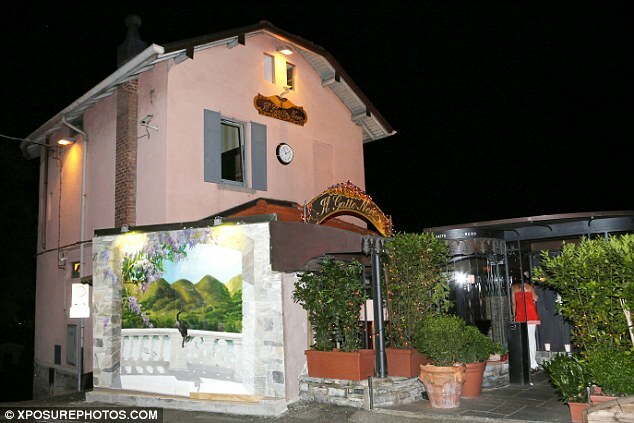 We also posted this on the George in Laglio thread. Thanks Nicky. Hope you are doing well! There are more pics on JustJared. They also got the date of the dinner wrong. They claim its from June 25th. One pic from inside the restaurant where there is a display shows the day as June 22. It's great to see them out together. They both look terrific, happy and relaxed. 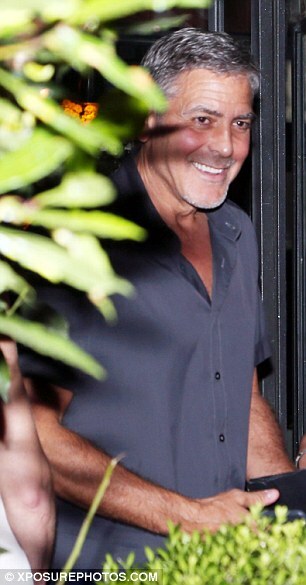 George is growing his summer facial hair back. 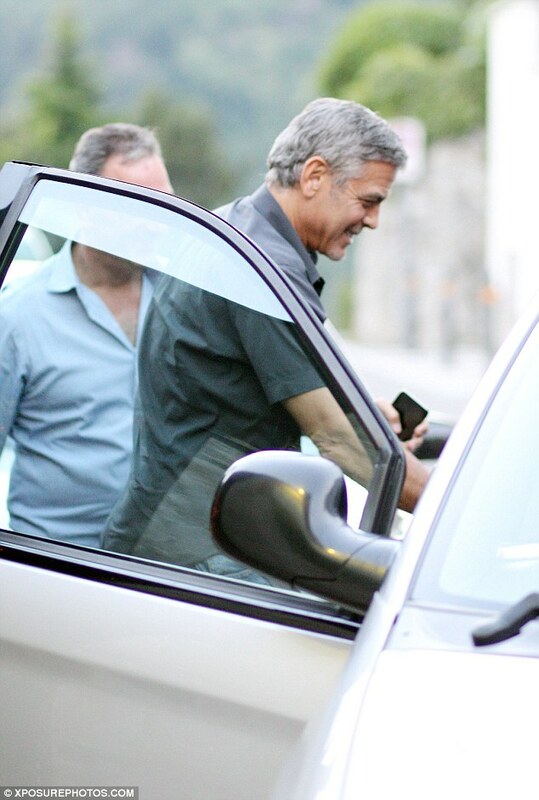 George Clooney is all smiles while chatting it up outside Il Gatto Nero restaurant after dinner on Saturday night (June 25) in Lake Como, Italy. The 55-year-old actor was joined by his wife Amal, as well as some friends. George is currently starring in the movie Money Monster, which tells the story of financial TV host Lee Gates and his producer Patty, who are put in an extreme situation when an irate investor takes over their studio.